Hong Kong has been one of history’s most successful incubators for entrepreneurs. Our goal with this program will be to help sustain and enhance that culture, enabling the next generation of digital innovators in Hong Kong. 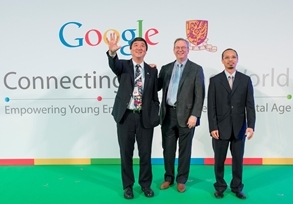 We are pleased to become a key partner of Google to create a sustainable entrepreneurship ecosystem in Hong Kong; encourage students and young entrepreneurs to innovate, think big; and connect to the global community of entrepreneurs. The Internet creates opportunities that make it easy for entrepreneurs to start new businesses, for small businesses to grow, and for all businesses to increase productivity. It’s easier than ever to go from a start-up in a garage to a “micro-multinational” with global reach. Hong Kong's well-developed infrastructure, free flow of information and ideas, and entrepreneurial spirits provide an ideal environment in which innovations can be unleashed. An mentorship program designed with CUHK; this will give entrepreneurs in Hong Kong access to mentors that can often be hard to reach in Hong Kong. Efforts to help young entrepreneurs overcome the startup costs and isolation that come with high rents and a fragmented entrepreneurship community. Google and CUHK also released the first comprehensive research assessing the viability of the local entrepreneurship ecosystem “Entrepreneurship Ecosystem of Hong Kong.” It revealed strong startup ecosystem growth in Hong Kong (Interim Report, English Infographic / Chinese Infographic) released in September 2014. The final report “Crouching Tigers, Hidden Dragons” is released in April 2014 (Full Report). Empowered Hong Kong’s younger generation to innovate, launch new businesses, and connect with Silicon Valley. Initiated a group of passionate experts, entrepreneurs, and investors to support, participate and coach on startups. Lifted Hong Kong over its ecological shortcomings in talent diversity, mentorship, and scope. In ways that no others have done in Hong Kong we brought the disconnected community together to cultivate innovative startups. The program got over 900 applications who are Hong Kong youngsters aged 18-35 with a passion for entrepreneurship and innovation. Over 600 participants join the Cross-Disciplinary Entrepreneurial Skills Training from February to April 2014. Participants learn the basics of entrepreneurship and technology know-how. 7 training workshops were held. 3 Mixer gatherings with inspiring speakers were held to stimulate ideas and facilitate team formation. Upon the completion of training, participants will be formed into teams to work on business proposals. 200+ individuals (40% have entrepreneurial experience) formed teams and submitted business proposals, reviewed by 50 professionals in Hong Kong. Presentation training was held to get them prepared for the Presentation Day. 40 teams were selected to receive one-on-one mentorship and advanced training from June to September 2014. 98 individuals received one-on-one mentorship, with the support of 40 mentors. A meetup was held for better mentor-mentee matching. 4 Mentor Alignment Sessions were held for the mentors to equip them with better understanding and skills on mentoring. 4 In-depth Trainings were held to teach the mentee teams the roll-out of a minimum viable product (MVP). Mentees also meet with experts who share valuable insights and their entrepreneurship stories on 3 Speaker Night. 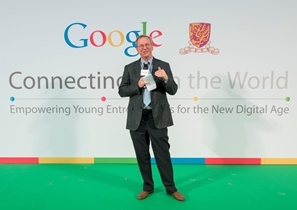 20 teams were selected to pitch in front of a panel of judges in September 2014 and top 6 teams were selected and sponsored to the Mountain View trip in October 2014. Learnt from Google about innovation and 10x thinking, followed by a campus tour. Connected with Evernote, Smule, SVForum, Startup Grind, Stanford, SkyDeck of UC Berkeley, nestGSV, Wearables World, and Institute for the Future. Full-day pitching to 500 Startups, Plug and Play, and Altos Ventures. All investors and EIRs were impressed and changed their perception of Hong Kong - not just an international financial center but a place with energetic entrepreneurs. HITA (Hands In The Air) is an integrated music tool that connects independent music to people globally; something that is missing in the market at the moment. Today including our consulting business and HITA, the team has grown from a three-people team in a crowded 60 sq. ft. room to now a 13-people team in a 600 sq. ft. (yet still crowded) office at the Hong Kong Science Park. Talk-now is a tool that allows deaf people to speak with able bodies. With110,000 deaf people in Hong Kong and Macau, our product can translate sign language to voice language, helps users to save at least 50% communication time and communicate with able bodies independently. Trafluence is an online marketplace reflecting the new trend in social media branding and how people travel. We aim to empower people to explore the world with their influence and skills, while creating value for businesses globally. We connect tourism dependent service providers with talented and influential travellers around the world. Not only can adventurers get discounts and perks, businesses will benefit from the traveller's skills, and increased social media exposure globally. enhance the power of the human eye, and help everyone to “See Better Live Better”. The team adopts a software approach called Binocular Video Tone Mapping (BVTM) in helping people to overcome the hardware’s lack of dynamic range, and help people who suffer from color blindness. JOBDOH is a last minute booking and scheduling mobile platform for casual workers. It optimizes the temporary and casual staffing industry, and reduces the inefficiency embedded in current system by facilitating more job matches between employers and casual employees. The solution caters to all SMEs or individuals requiring labor help, we plan to start with the hospitality industry, which our findings show a large turnover and needs to hire temporary/casual help. Myflat.hk is a private neighbourhood social network to rebuild the connection among neighbours and strengthen the local community spirit. It allows people to communicate within two levels - “district level” for a wider community; and “estate level” for people living in the same estate or building with verification process applied.